1. I buried my last grandmother. god exists somewhere in tortured minds, perhaps everywhere. grandmother's grave was dug by 7 convicted men in baggy orange pants. according to the green led display in the cadillac deville provided by avis, it was 110 degrees outside. i didn't have any black pants and wore navy chinos. a dirt track leads to parcel #10 behind the church which will be auctioned off by sealed bid in september 1999. reverend hall said "cast me not off, in my old age". he looked like cab calloway. the tent and supplies for the interment were removed from the cemetary by a sport utility hearse. the guards from the louisiana department of corrections loosened uncle fred's hands and shared barbecue ribs with the family for 90 minutes after the service. i sat in the back of the chruch with paul who told me about the mill, the oil field, the high school, the mandatory sentencing laws, the sonic, the mc donalds, the kfc, the population is 1800. there are 7 old folks remaining. two months after aunt annie bought her home, they built the housing projects around the corner. i didn't see any white people all day, except for the men fixing the roof on this hotel. they put concrete slabs over the gravesites. gallons of prideful salty water coursing through these drowning suburbs. membranes bangs innumreate tiny drums into insecurity. Understanding gropes along the unimaginable, childlike, wondering. 3. 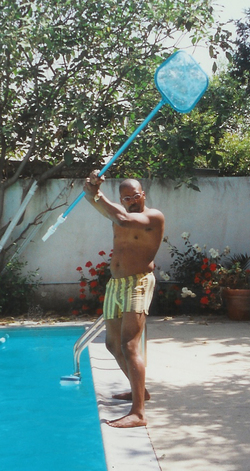 I lived in Altadena, CA in a house with a pool. I was a suburban samurai, and one of my favorite things to do was take the minivan to Target and buy cute clothes for my kids. I was just learning to BBQ and got a new smoker. I timed my chicken rotation to various parts of Coltrane's 'Giant Steps' CD. I grew roses, marigolds and pansies, and played basketball on the garage hoop. 4. I commuted weekly to Silicon Valley where I was a blue shirted business development manager. I was making boucoup bucks, had a nice portfolio with Dean Witter and didn't have a financial care in the world. 5. I was at the beginning of a long and expensive custody battle over my son. I eventually won. 5. I was at the beginning of a long and expensive tax battle with the IRS. I eventually lost. 7. I only had 20 MP3s.